During the 1980s and the 1990s, the Cuban international tourism sector expanded at a rapid rate. Annual growth rates during the 1980s averaged 11.9% and the average annual rate of increase during the 1990s was approximately 18% (Espino 1992, 2000). The tourism sector soon became the star performer of the “special period.” At the turn of the Century, enthusiastic tourism officials predicted that Cuba would host 5 to 7 million tourists by the year 2010 (Rice 2000; Pérez-Mok and García 2000). Performance of the sector during the first decade of the 21st Century, however, has been lackluster at best. Annual growth rates of tourist arrivals during the decade averaged only 4.6%, with negative growth posted for three years. It is now clear that visitor arrivals are unlikely to hit the 2.5 million mark in 2010, half of the low end estimate made in 2000. As disappointing a performance as the official visitor arrivals numbers reflect, a look behind the data reveals further reasons for concern. This paper looks into the performance of the Cuban tourism industry in the new century and explores the changing pattern of tourist arrivals as well as its present and future consequences. The first decade of the 21st Century was a challenging one for world tourism, particularly in the Caribbean. During the decade, international travel was dampened by two economic downturns: terrorist threats and health concerns over flu and epidemics. In the Caribbean, the industry had to additionally deal with overactive hurricane seasons and historically high fuel prices towards the middle of the decade. Inevitably, all of the above-named factors impacted the Cuban tourism industry. Furthermore, the U.S. embargo and travel restrictions denied the Island free access to the largest source of tourists to the Caribbean and excluded it from the sea-cruise industry, leaving the Cuban tourism sector with a higher degree of exposure to external adverse economic and security conditions than the rest of the Caribbean. The poor performance of the Cuban tourism industry, however, cannot be attributed solely to external factors. Internal policies and inefficiencies have also contributed to its poor performance and loss of competitiveness (Espino 2008). Following international guidelines, the Cuban government collects data on international visitors. Visitors are classified as either tourists or excursionists. A tourist is defined as a visitor staying at least twenty four hours in the country visited, whose purpose in making the journey can be classified as (1) leisure (recreation, holiday, health, study, religion, or sport): (2) business; ( 3) family; (4) mission; or (5) meeting. An excursionist, or day visitor, is a visitor staying less than twenty-four hours, such as sea-cruise travelers. The majority of visitors to Cuba continue to be tourists, that is, their stay in the island lasts longer than twenty-four hours (Table 1). The low number of excursionists in Cuba can be primarily attributed to the island’s exclusion from the sea-cruise industry as a consequence of the U.S. trade embargo. The tourist/ excursionist breakdown that exists today in Cuba is quite different from that prevalent in the rest of the Caribbean with the increasing importance of the seacruise industry. In 2009, for example, 2,430 thousand international visitors arrived in the Island; of these only 25 thousand were excursionists. During the same year, the Caribbean as a whole hosted 41,153.1 thousand visitors of which 19,063.3 thousand, or 46.3% were cruise passengers. The difference in tourist/excursionist breakdown makes is necessary for any comparisons of the performance of Cuban tourism to the rest of the Caribbean be done on the basis of tourist arrivals rather than visitor arrivals. 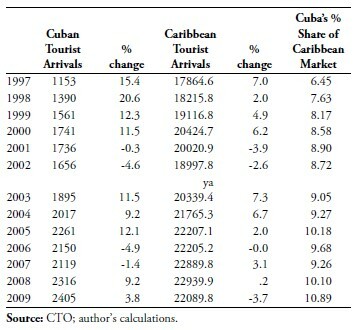 Table 2 compares total tourist arrivals to Cuba to arrivals to the Caribbean as a whole. The year 2000 was a bumper year for the Caribbean tourist industry, with tourist arrivals increasing by 6.2%. In Cuba, the double-digit growth rates of the late 1990s continued into the new decade with arrivals growing by 11.5%. Cuba’s share of the Caribbean tourist market increased to 8.58%. All indications pointed to continued growth. The terrorist attacks of September 11, 2001 disrupted the travel industry worldwide, and tourist arrivals to the Caribbean tumbled by -3.9%. Cuba, with its high tourist season over by the time of the attacks, saw only a slight decline in tourist arrivals of -0.3% and its share of the Caribbean tourist market continued to grow, reaching 8.9%. The brunt of impact of the terrorist attacks hit Cuba in 2002. Tourist arrivals in that year decreased by -4.5% as European arrivals to the Island fell by -4.3% and Canadian arrivals fell slightly. While the rest of the Caribbean experienced similar performance from the European and Canadian markets, arrivals to the Caribbean as a whole were buoyed by improved arrivals from the U.S. and total arrivals decreased only by -2.6. In 2002, Cuba’s share of the Caribbean tourist market fell to 8.7%. By 2003, both the Cuban and Caribbean tourism seemed well on the road to recovery. From 2003 to 2005, tourists arrivals to Cuba grew at an average annual rate of 10.9%, outpacing the Caribbean, where arrivals grew at an average annual rate of 5.3%. Cuba’s share of the Caribbean tourist market rose to 9.5% in 2003, 9.27% in 2004, and 10.18% in 2005. A closer look at Cuban tourist arrivals during this time period reveals some temporary, if not artificial, arrival numbers, however. Venezuela represents an interesting case. From 1990 to 2003 the average number of tourists to Cuba from Venezuela in any one year was 11.8 thousand. In 2004, arrivals shot up to 86.3 thousand. During 2005, the number of arrivals from Venezuela reached 185.2 thousand, retreating to 83.8 thousand in 2006. This anomaly is due to “Operación Milagro,” part of a cooperation agreement between Cuba and Venezuela, that consisted of flying in Venezuelans to Cuba to receive free medical care. 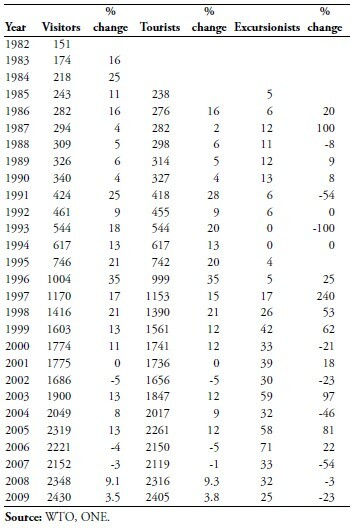 While these numbers level down by 2007 (see Table 3), they significantly inflated the total arrivals numbers during 2003–2005. Also of interest is the performance of visits by Cuban nationals residing abroad, mostly in the U.S., which are grouped under visitors from “Other Caribbean.” The number of arrivals in this category are intrinsically tied to the policy of both Cuba and the United States. Cuban-Americans visiting family in the Island travelled in record numbers to Cuba in 2002, 2003, and the first half of 2004. Their numbers counterbalanced the decreases in visitors from other sources due to security concerns in the aftermath of terrorist attacks of September 11, 2001. In June 30, 2004, new U.S. restrictions on travel to Cuba came into effect. While the new rules reduced the ability to obtain licenses for all categories of travel, the largest number impacted were individuals travelling on family visits, almost exclusively Cuban- Americans. Whereas before the restriction ‘family’ was liberally interpreted, the new rule restricted travel to immediate family—parents, spouses, children and siblings. Before the restriction came into place, visits were allowed once a year, but the new restrictions limited family visits to once every three years. The impact on the number of visitors travelling to Cuba from the U.S. had an immediate impact. In 2004, Cuban official statistics reported a decline in the number of visitors from the U.S. of 34.6 thousand visitors. The decline in the “other Caribbean” category was of 42.8 thousand visitors. The reduction in total visits by U.S. citizens and residents in the second half of 2004 therefore is approximately 77.4 thousand visitors. On October 24, 2004, Cuba reacted to the new U.S. policy by announcing that the U.S. dollar would not be acceptable as legal tender in the Island as of November 8. The holding of U.S. dollars was not criminalized but its use prohibited; dollars now needed be to exchanged to convertible pesos. A 10% fee was also imposed on each U.S. dollar/convertible peso exchange. In April 2005, the value of the convertible peso, which traded with the dollar at par, was increased by 8%. This measure, along with the 10% fee, effectively raised the rate of exchange to $1.20 per convertible pesos (Mesa-Lago 2005). While the 10% fee is not applicable to tourists using currencies other than dollars, the 8% revaluation of the convertible peso and the transactional cost (both explicit and implicit) of exchanging currencies to the convertible peso, effectively increased the cost of a Cuban vacation. The 2003–2005 tourism recovery proved to be short lived for both Cuba and the Caribbean as a whole. In 2006, increased transportation costs due to record high fuel cost kept tourist arrivals to the Caribbean slightly under the 2005 numbers. For Cuba, high transportation costs combined with the increase cost of a Cuban vacation, took their toll. Tourist arrivals to the Island decreased by -4.9%, and while the Caribbean as a whole posted a 3.1% increase in tourist arrivals in 2007, arrivals to Cuba declined for the second consecutive year by an additional -0.4% . During 2006 and 2007, Cuba lost competitiveness in both the Canadian and European Caribbean tourist markets. 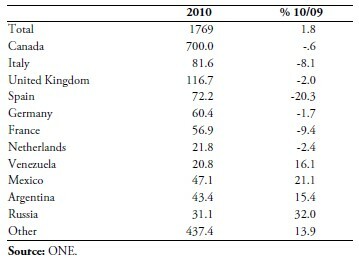 Cuba’s share of the Canadian market, which had been growing steadily throughout the decade, declined in 2006 and more significantly in 2007 (see Table 4). Regarding the European market, Cuba’s share declined more significantly, from 19.1% in 2005 to 16.8% in 2006 and 16.7% in 2007. Cuba’s overall share of the Caribbean market also declined to 9.68% in 2006 and 9.26% in 2007. The last two years of the decade saw the world travel industry dampened by the global economic downturn. The impact of the global recession made itself felt on the Caribbean tourist industry, slowing down arrivals to a 0.2% increase in 2008 and decreasing them by -3.7% in 2009. Interestingly, tourist arrivals to Cuba saw the opposite behavior. Arrivals increased during this time by 9.2% in 2008 and by 3.8% in 2009. Cuba’s share of the Caribbean market also increased to 10.10% in 2008 and 10.89% in 2009. The growth of arrivals to Cuba during this period must be attributed to the increased visits to Cuba by Canadians and Cuban-Americans (see Table 2). While the increased visits by Cuban-Americans can easily be attributed to the easing of travel restrictions by the Obama Administration, Cuba’s ability to attract Canadians during this period deserves further analysis. The increase in the number of Canadian tourists to the Island may be attributable to two factors: an overall increase in Canadians choosing a Caribbean vacation and an increase in Cuba’s competitiveness in the Canadian tourist market. Faced with a relatively unscathed economy despite the global financial crisis, an appreciated Canadian dollar, and harsh winters, Canadian vacationers have been flocking to the Caribbean in record numbers. Canadians arrivals to the Caribbean grew by 15.1% in 2008 and 5.8% in 2009. While Cuba has no doubt profited from the strong growth in Canadian travel to the Caribbean region, there is also evidence of an increase in Cuban competitiveness in the Canadian market. Cuba’s share of the Canadian Caribbean tourist market grew sharply during the last two years of the decade. Cuba attracted 34.1% of all tourist visiting the Caribbean in 2008 and 36.1% of those visiting in 2009. It is hard to pinpoint why Cuba was successful in attracting such a large share of Canadian visitors to the Caribbean. However a look at the gross revenue numbers hints at Cuba engaging in serious price reductions. Since the 1980s, Cuba has turned to the Canadian and European markets to make up for the loss of the U.S. tourism market. This is still the case today, with these two markets accounting for 72.2% of all international arrivals to the Island in 2009. During this decade, however, their individual share of the market has markedly changed. While in 1999, Canadians made up 17.2% of all tourists to Cuba, their weight in total arrivals has increased steadily and stood at 37.7% in 2009. In comparison, Europeans who made up 54.6% of all tourists to the Island in 1999, only accounted for 34.5% 2009. This reduction is even more pronounced when we look at the share accounted for by the major European tourist suppliers. The five major European tourist suppliers, which accounted for 45% of all Cuban tourists in 1999, only accounted for 25.9% in 2009 (Table 5).The face of the Cuban tourist is no longer Spanish, Italian, German or even European. This changing pattern has implications beyond image; it impacts total tourist expenditures and the volatility of the arrivals. Canadians’ increasing weight in the Cuban tourist industry results in significantly lower average expenditures per tourist. Canadians tend to stay less time in Cuba than Europeans and to spend less per trip. In Table 6 we see that while total visitors to the Island grew by 51.6% in the decade, total gross revenues grew by less than 10.3%, and average revenues fell by -27.2%. The increase reliance on a single market, Canada, increases Cuba’s exposure to developments in that market and increases the overall volatility of the tourism sector. This is a lesson that Cuba might soon learn. Canadian visits to the Caribbean have significantly slowed down in 2010, growing by just 1.0% from January to June. The impact is already being felt in Cuba (see Table 7). 2010 promises not be a good year for Cuban tourism.